As soon as I saw this mentioned on a favorite blog, I had to try it. It’s a Dutch Baby. I thought maybe it was another name for a pannekoeken, but apparently not. It is ridiculously easy. Preheat oven to 425 degrees. Spread out bacon in a cast-iron (or any heavy-bottomed oven-safe) 8-10 inch frying pan, and place in the oven while it heats. Meanwhile, whisk together eggs and milk until well blended, then add it to the flour and salt a bit at a time. Mixture will be a very thin liquid. Stir in shredded cheese. When the oven is hot, get the pan back out. If the fat from the bacon does not cover the bottom of the pan, add a bit of butter to make sure the entire bottom of the pan is greased. Pour in the batter, place back in the oven, and bake for 20-25 minutes. Serve immediately — the longer you wait the flatter it gets. Top with a bit of powdered sugar, maple syrup, and/or plain greek yogurt. 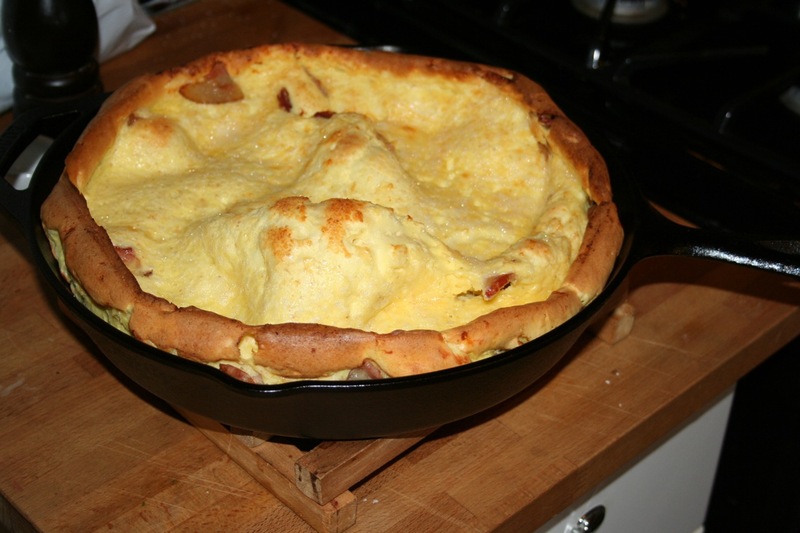 Simplest Dutch Baby: omit bacon and cheese. Place 2-3 T. of butter in pan as it heats. Still really great, especially with maple syrup. Bigger Baby: increase to 3/4 c. flour, 3/4 c. milk, and 6 eggs. We’ve made the bigger version a couple times but recently decided it’s a bit much for our 2 adults + 2 small people, especially if we have oranges or anything with it. 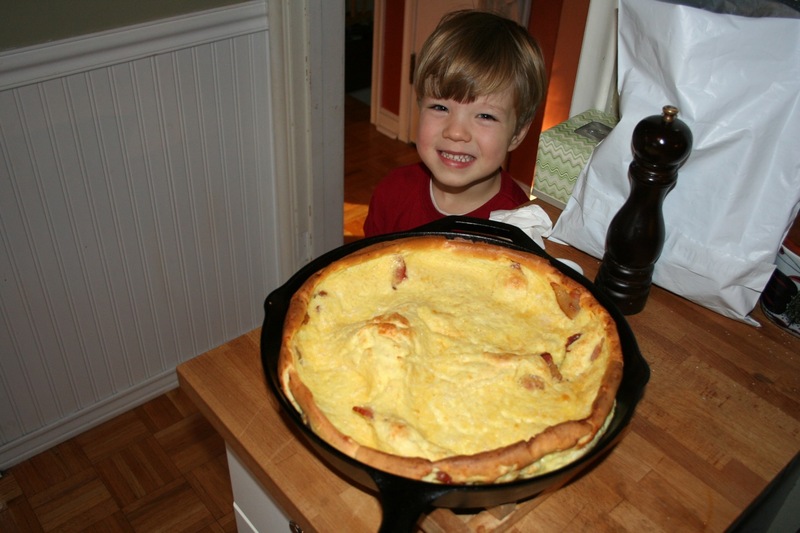 My Dutch pre-schooler with a rather large Dutch baby. I could eat this every single day. Having a really great Thanksgiving holiday. 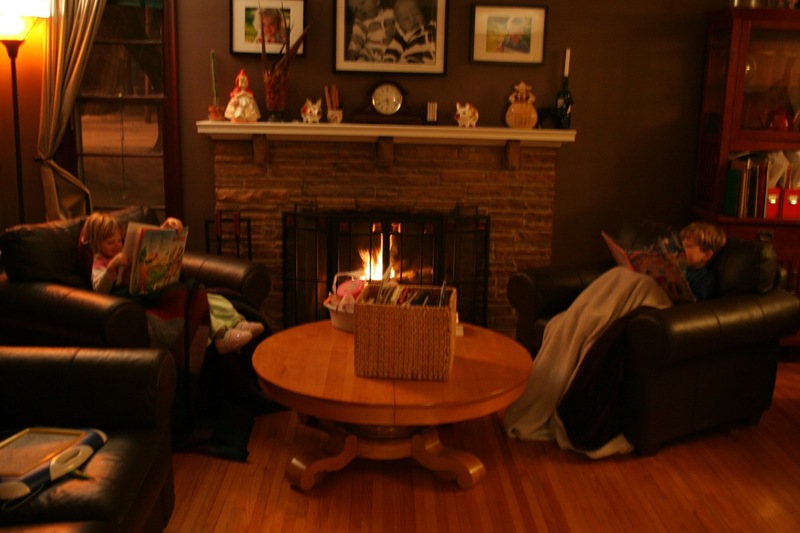 It started with a snowy day last weekend — the perfect kind where you get a nice cozy day by the fire and then it all melts within 2 days. Bacon ends — I love it that my favorite grocery store carries random, value-minded stuff like this. 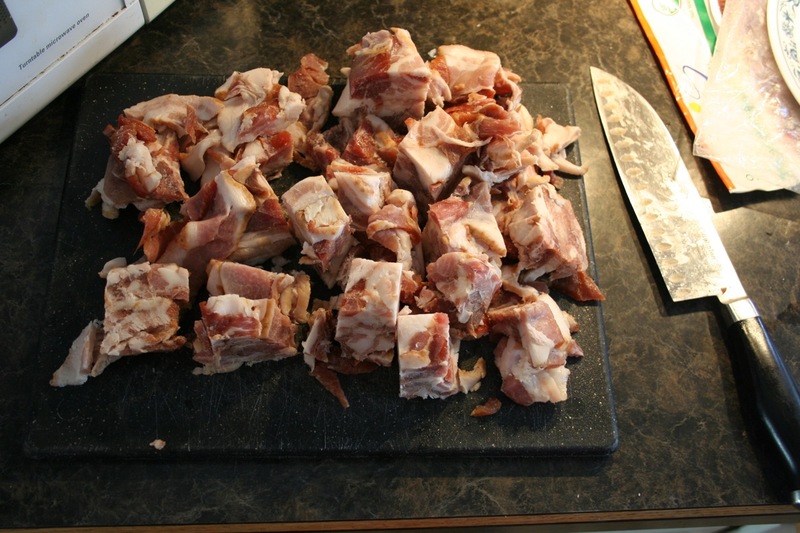 Cut up into small chunks and frozen individually, these will add a bit of glorious bacony flavor to many dishes in the next few months. My first batch of kombucha turned out! (As did the pumpkin pie in the background.) 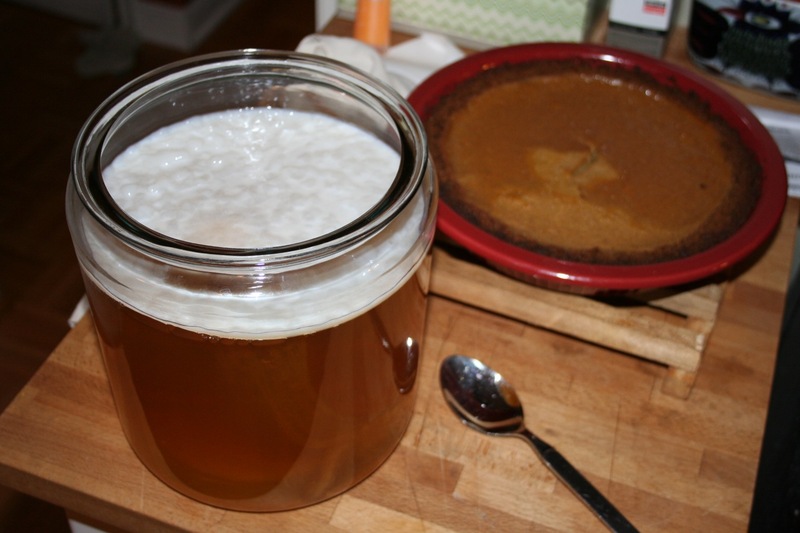 That white part on the top is the “SCOBY” (Symbiotic Culture of Bacteria and Yeast). It started out as a film, but slowly grew into a solid mass reminiscent of soft beeswax. My kombucha is not as fizzy as store-bought, but it has a good flavor. And now I have extra SCOBY to share with friends. Locals, let me know if you want some. 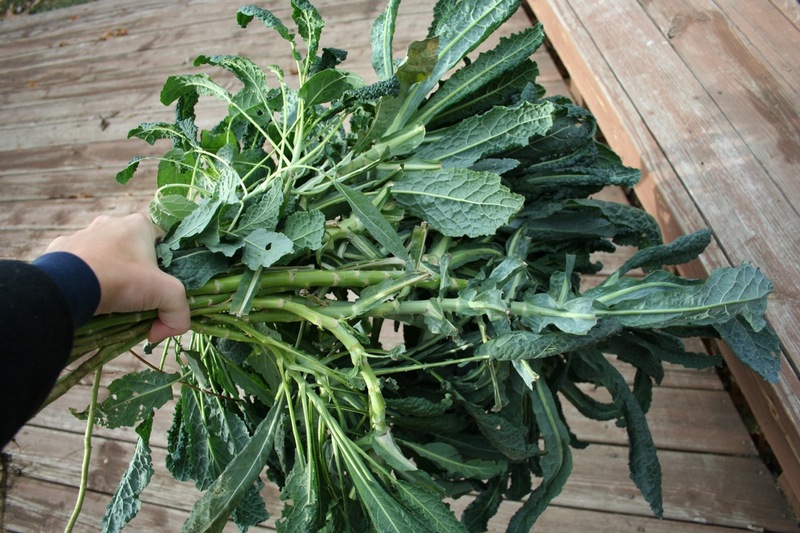 Cleaned the last of the lacinato kale out of the garden today. We’ll use a lot of it, and I also gave a rather large bag full to a friend for her pet rabbit. 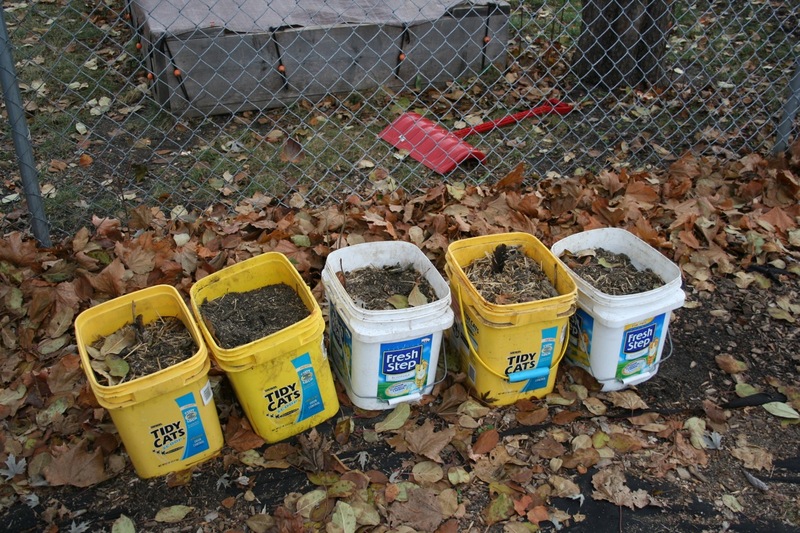 And finally, the reason I pulled those last few kale plants: so that I could spread these 5 glorious bucketfuls of chicken manure/used bedding on the garden. Friends with chickens are great friends indeed. Happy Thanksgiving everyone! 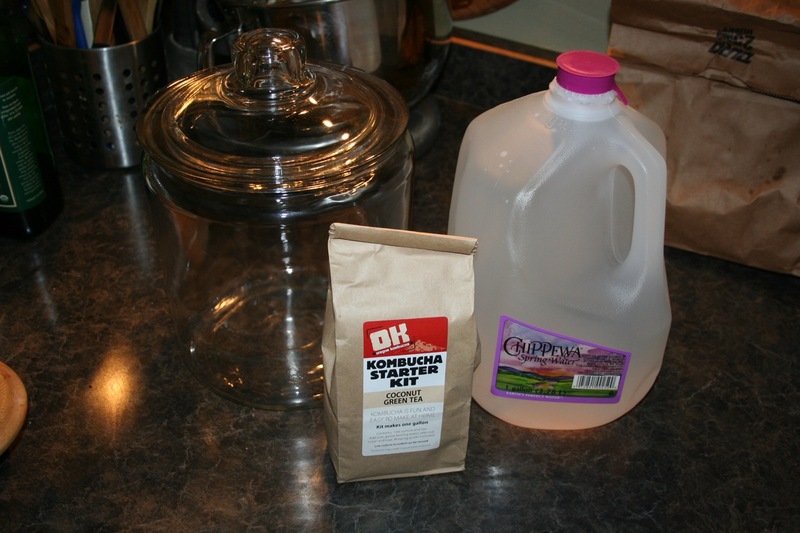 Categories: Gardening, Practical, Yeast/Fermentation | Tags: compost, kombucha | Permalink. Urine samples taken during each week of the experiment found that BPA levels increased by 1,221 percent during the week that the participants had canned soup for lunch. Now, I posted this article on Facebook and a friend pointed out that an increase of 1221 percent is meaningless if you don’t know the base number. He’s not wrong, but what concerns me is this: BPA is one of *many* toxic chemicals that are now in our food and water supplies. Measured individually, each one might come in at a safe/acceptable level, but what about when taken altogether? No one is studying this, because it would be absolutely impossible to study scientifically. Your research subjects would have to live in a bubble. Control is such a hard thing. We want to control every aspect of our existence, but we simply can’t. Accepting that can be so hard. I want to follow steps A, B, and C and then get result D. But life has never, ever worked out that way. I can’t do much to control the toxins I take in through the air and even to a large extent, the water. Food, then, is one of the few areas where I do have a choice. The study specifically mentioned canned soups; I can’t think of a easier thing to phase out. I am not much of a cook, but soup is pretty much the easiest thing in the world to make. Take a crockpot. Add some water and some veggies, legumes, meat, and/or herbs. Turn it on and leave it for 8 hours. Done. Every time I make soup, I double the recipe and freeze the leftovers in glass pint jars. Fast, BPA-free food. What do you think, gentle readers? Are you taking steps to avoid canned food? Categories: Cooking and baking, Labels, Nutrition, Practical, Theoretical, US Food Production | Permalink. Here’s an area I’m just starting to, uh, get my feet wet in. 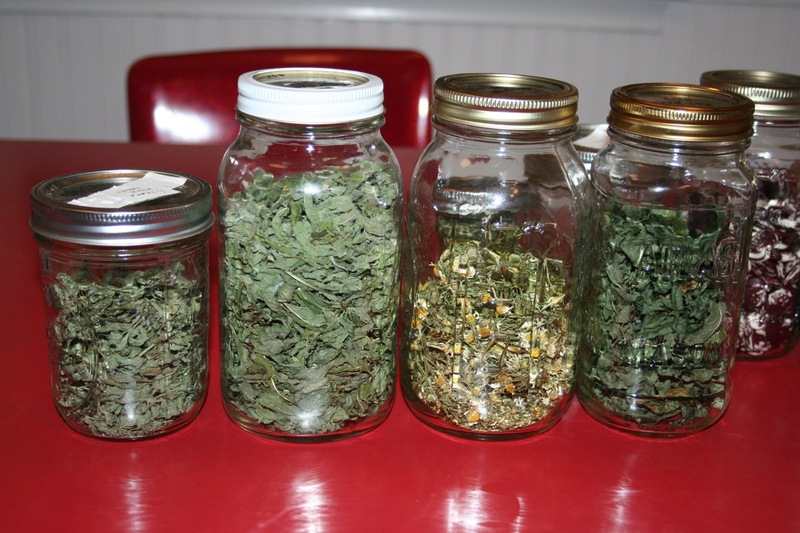 A while back, I realized how fantastic certain herbs tasted when homegrown and dried. Last year, we had a very respectable herb store for the winter. We still have a bit of 2010 thyme left, more than enough to last us until April, so I didn’t dry any thyme this year. German Chamomile: technically an annual, but I’ve had reports from other master gardeners that it re-seeds itself readily. It definitely needs full sun, and an open, breezy spot would suit it well — I’ve had mine fall victim to powdery mildew a few times. 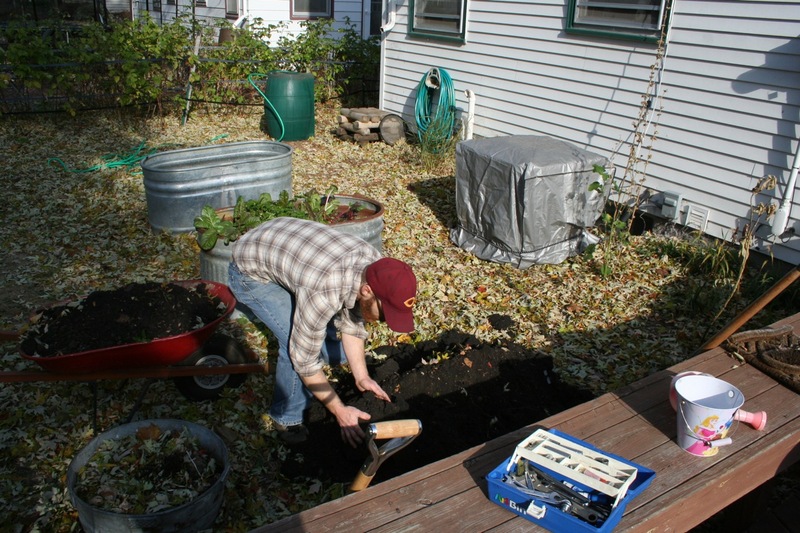 Mint: there must be 4,000 varieties of mint, and all are perennials that do well in MN. Be aware that mint can become invasive in full sun. Better to plant it in part (but not full) shade to keep it under control. Feverfew: looks and acts a lot like chamomile. Can be used medicinally for migraines. On my list to try for 2012. Lemon Balm: another one with many varieties. Useful in salad dressings, too. Also on my list to plant in 2012. Anise Hyssop: a midwest native that will tolerate part-shade. Licorice-flavor tea. On my 2012 list. Valerian: gets four feet tall! Root is used as a sedative. Well there you have just a few, but there are many, many more. We’ve also made tea with sage and raspberry leaves, since we usually have them in ready supply. 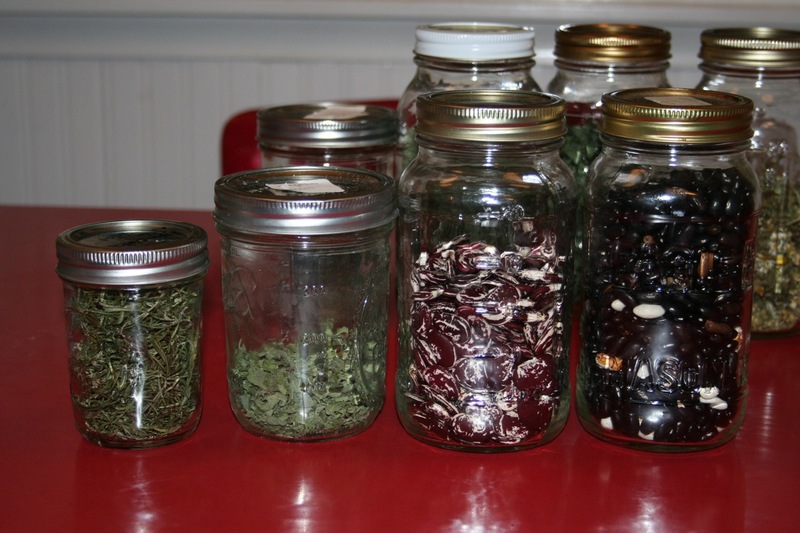 1/2 pint (packed) rosemary, a bit of oregano, Christmas lima beans and Cherokee Trail of Tears beans. I know that dried beans are super cheap to buy, but you can’t really buy the heritage ones anywhere. They are super fun and easy to grow, so why not?! 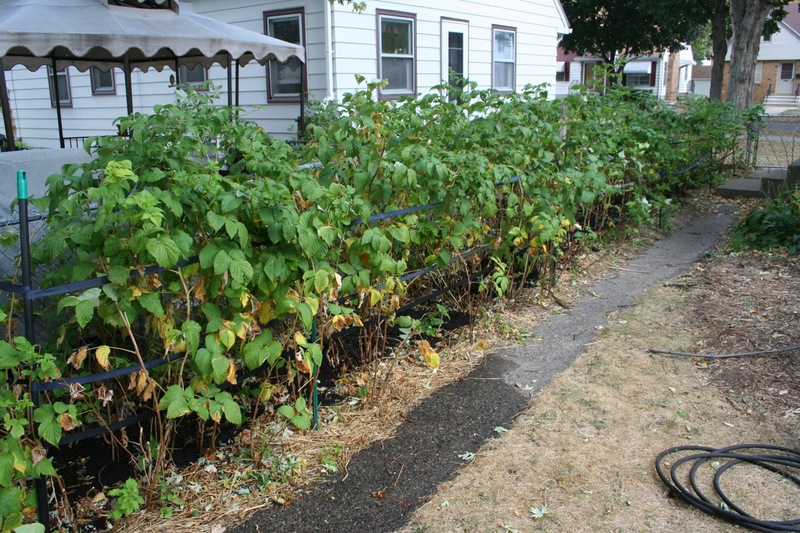 Unfortunately many of us in the Twin Cities had uninspiring bean harvests this year, but… well… there’s always next year. 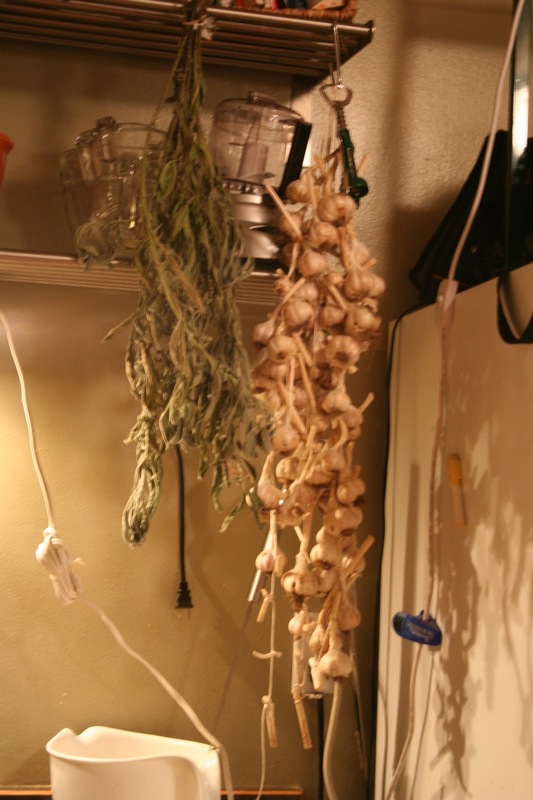 Finally, sage and garlic in a very inspiring picture, photographically speaking. Good grief. Anyway, you get the idea. This will be the first time ever that we might just make it until next year without having to buy garlic. The sage should be dried out in another week. It’s so great having some of our harvest put-by with minimal effort — drying could not be easier or less resource-intensive. Categories: Gardening, Permaculture, Practical, US Food Production | Tags: beans, edible landscaping, garlic, herbal tea, Permaculture | Permalink. We’ve had such a long, warm, glorious fall here in Minnesota that time got away from me. Suddenly I realized that it was nearly the end of October. Time to get to work! Here was one small accomplishment for early October: my raspberries needed a little TLC. Our raspberry harvest this year was 1/4 of what it was in 2010. This was partially due to the weather — we had a horrendous July in which the weather was evenly split between torrential rains and tropical heat/humidity levels. But I also haven’t amended the soil underneath the raspberries at all since Adam planted them in back in 2007 (I was 32 weeks pregnant with twins, so it was all him). 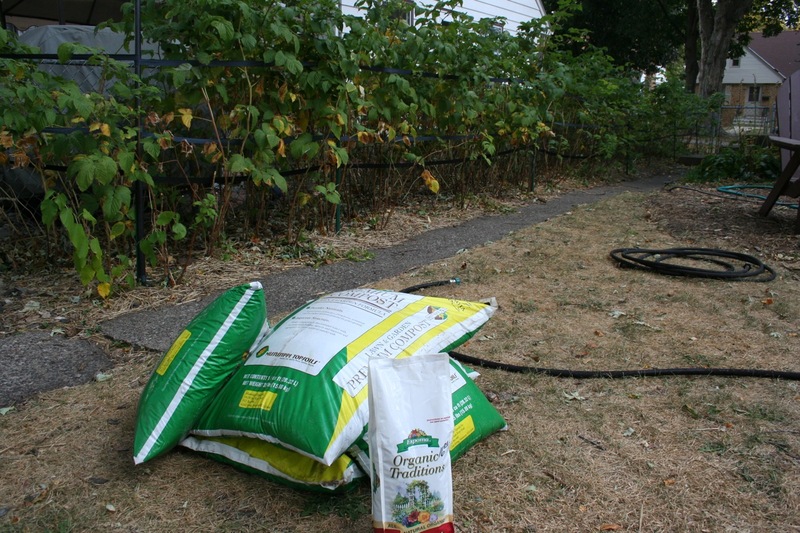 So to give them a little bit of care and feeding, I bought a bag of blood meal and topped it with 4 bags of compost. This was enough for approximately half of my raspberries. I spread out the blood meal as best I could — that stuff’s expensive — and got compost out of my own compost bin for the other half. There’s a little more square footage there than I always think. I then gave them several good waterings over the next couple weeks — as you can see our lawn was (and still is) completely dead. It is very dry here right now. 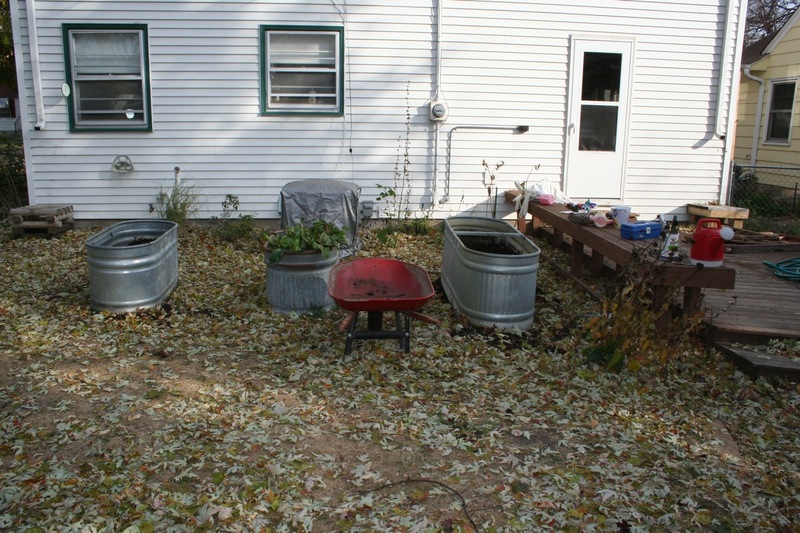 Now this week our maple tree unleashed all its leaves, so we are piling them at least a foot deep on the raspberries. Leaves are mother nature’s free mulch — don’t waste your time and energy bagging them when they could be protecting and nourishing your plants! Hopefully 2012 will be a better raspberry year. 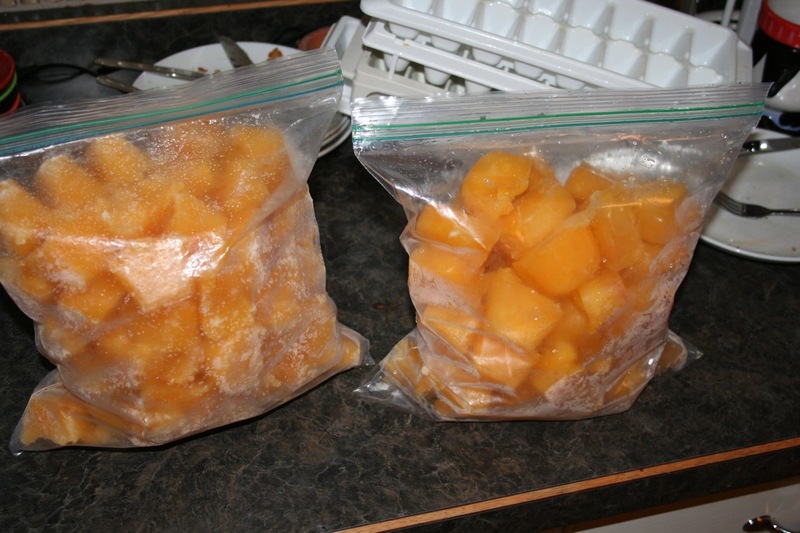 It wouldn’t be fall in our kitchen without a couple bags of pumpkin in the freezer. Here’s how we do that. I am also brewing my very first batch of kombucha! I’ll let you know how that goes — should be ready around Thanksgiving. 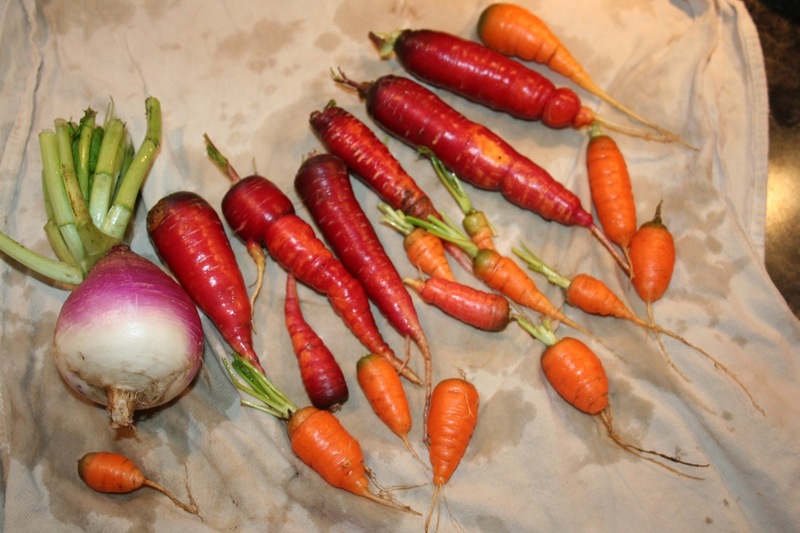 The other day I went out to see if there were any carrots left in the garden, found a whole soup pot’s worth, plus a bonus turnip. I finally got around to planting my garlic yesterday. Unlike last year, I have not the faintest idea yet how I want to structure my garden for next year, so I just threw these in on the far east (right) side, three rows all in a row. I am definitely going to regret not giving this more thought, but at least they’re in. Final task: getting our third stock tank into place for our back yard garden. I received two of them as birthday presents this spring from my parents, and a few months later I found a really nice third one to add for next year. Aesthetically, we really needed three of them to complete the landscape I am envisioning. Poor Adam had to shovel most of the dirt out of Rowan’s tank to move the new one into place — since it’s larger, it looks better in this larger area of the garden. But it didn’t take that long in the end. There you have it, two small and one large tank in place and ready for next year. The middle one (Anneke’s) is still FULL of swiss chard, going strong. That along with parsley and kale in the regular garden means we might have a couple more weeks yet of from-the-yard food. In November! Amazing. We’re also going to build a hoop-house (something like this) this winter to put on top the largest of the three tanks — it creates a mini-greenhouse and means we could be eating lettuce and baby greens in April or May instead of June. Yes, please! 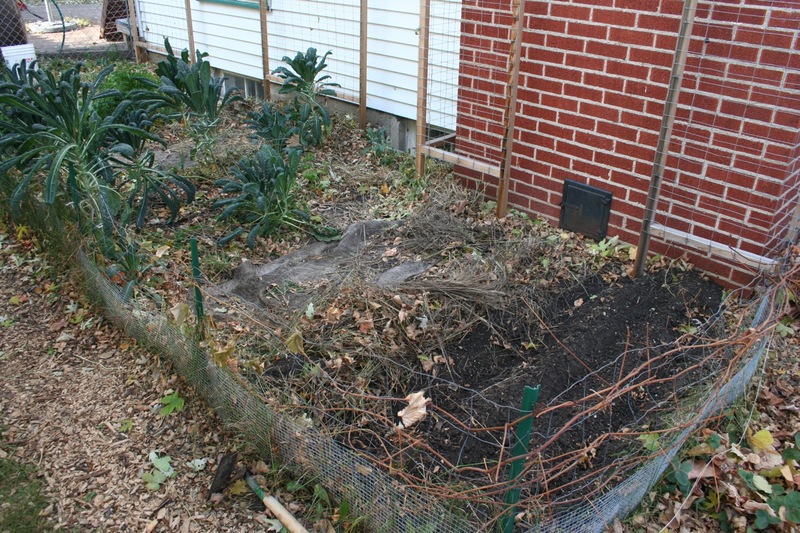 Categories: Gardening, Practical | Tags: edible landscaping, garlic, kombucha, raspberries | Permalink.